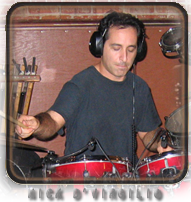 Nick D'Virgilio is one of the premier modern rock / progressive rock drummers on the scene. He has worked with Genesis, Spock's Beard, Tears For Fears, Kevin Gilbert, Jordan Rudess, Mike Keneally, as well as numerous other side and solo projects. Nick delivers everything from solid pop grooves to quirky odd time signature prog grooves. This combined with his signature pop sensibilities and skillful melodic playing make Nick D'Virgilio a modern rock powerhouse. Studio ProFiles are recorded at 24-bit resolution directly into ProTools� HD using only top studio equipment such as Neve�, SSL�, API�, Manley�, Great River� and more. They deliver ready-to-use, album quality material and an authentic sound with outstanding character that is inspiring for many styles of music. Nick D'Virgilio, Mark Hornsby and Sonic Reality CEO Dave Kerzner recorded much of this unique library at "Mower Studios" which was formerly known as Kevin Gilbert's Lawnmower & Garden Studios. This room was designed to offer a sound similar to the Townhouse studio in London. Both Nick and Dave used to play in this room in the mid 90's when working in Kevin Gilbert's band "Thud" and "Giraffe" (which played a one off tribute to Genesis - The Lamb Lies Down on Broadway" in 1994) Nick's library includes more than 650 stereo loops, recorded in a broad range of modern styles, feels, and time signatures. Also included are some veritable loops reflecting D'Virgilio's influences and the music he has played. Ample fills, variations, and tempos give you the substance and flexibility required to take your projects to the next level!